The gabled roof is one of the most popular architectural styles in the world. It can add style and charm to a house, and can transform a pergola into a highly functional and attractive outdoor living area. A gabled pergola has several benefits over a flat roofed pergola. A gabled roof is a pitched roof with triangular shaped gables at the ends. Because the roof is raised to a ridge rather than flat, it creates the impression of more height and space under the roof (which there is). 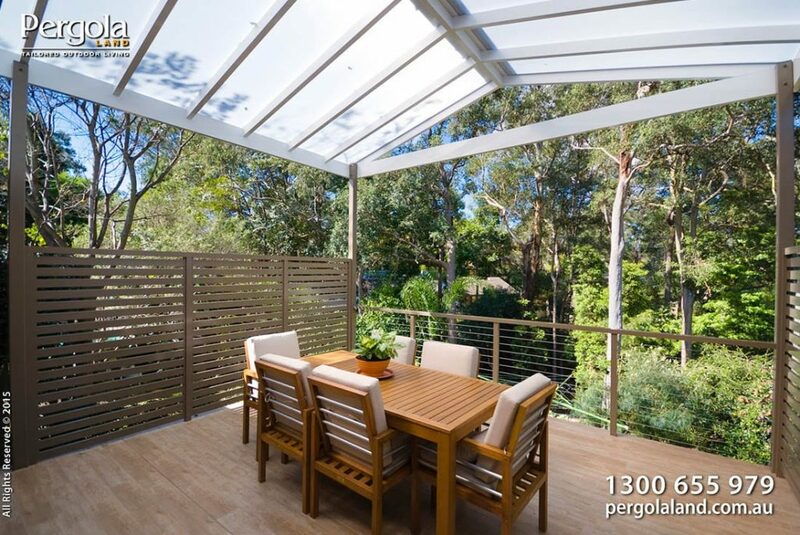 In the case of a pergola, this serves to give the area a more enclosed feel, turning what might otherwise be a flat featureless veranda roof into a true indoor/outdoor living area. Gables can be highly decorative, too, and can be creatively painted or even trellised to allow vines to grow through them. This can give your outdoor space a relaxed Mediterranean feel, which makes for wonderful summer entertaining. Gabled roofs are better in the wet months, as the pitch of the roof means the water runs straight off. While flat roofs can collect rain water and cause structural problems, a gabled roof funnels it away fast through a simple design that takes full advantage of gravity. Because of their shape, gabled roofs deal with hot summer sun much better than flat roofs. While the sun strikes a flat roof from one angle, heating it up very quickly, the sloping sides of a gabled roof mean the sun strikes the roof more indirectly and thus does not heat it up as fast. If the gables are open on the ends of the roof in summer, this also creates better airflow under the roof, allowing heat to dissipate naturally. Because the gabled roof is such a simple tried-and-true design, a pergola with a gabled roof can be constructed relatively quickly, which can be a cost saving. The simplicity of the design also means low maintenance, with steel or aluminium frames being highly weather-resistant and requiring very little attention from season to season. If there are any drawbacks at all to gabled roofs, it could be argued that they are not suitable for areas prone to high winds, as a cyclone or tornado could possibly get under the cavity and tear the roof off. Apart from that, gabled pergolas tick all the boxes, providing aesthetic appeal, added protection from rain and heat and ease of construction to save you money. It is a magnificent design that has stood the test of time and would be an excellent choice for any outdoor area.